I was playing with this the other day. Since I had so many bags of Millet at home. 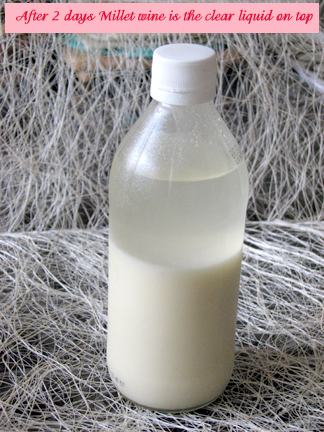 the fermentation process is the same with the Red Glutinous Rice Wine. After 3 days, some wine is showing around it. After 7 days, wine is separated, millet must was thrown away. After 2 days of standing time, the wine separates again. 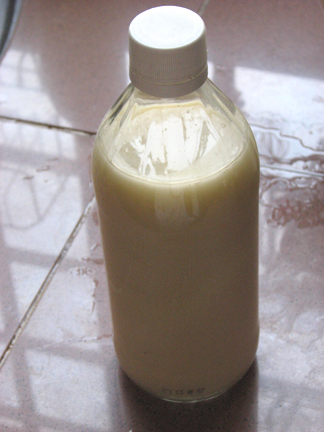 The clear liquid is the real Millet wine. The bottom murky liquid is part of yeast, millet residue. the taste is rather unique. its a bit sour and the after taste is sweet. I only made 200g of millet and the yield was only 120ml. I harvested it after 7 days. I am going to make another batch and will ferment it longer and see if the taste differs or not. 1. Add water to a sauce pot to boil. 2. In the meantime, wash millet and add into the boiling water to cook for brief 10 mins over high heat. 4. Leave it till millet soaks up all the water. 5. 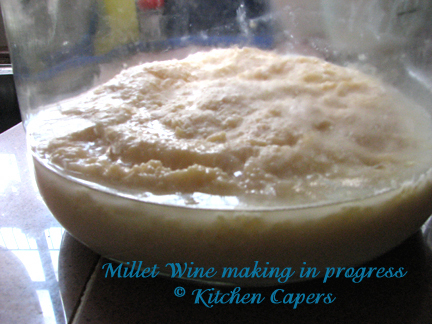 Make sure millet is completely cool before mixing the wine yeast. 6. Place in a clean glass jar, cover with a towel then by the jar's cover. 7. Leave it undisturbed for 7 days.